TOGETHERNESS is a new show produced by the Duplass brothers team that premiered Sunday on HBO. The Duplass brothers are known for projects, on television and the big screen, that bring realism back to film a television. Their characters are often funny and clever and unique, however, they are extremely relatable. Their projects do not make their audience envious of something that can never be, but rather, use a relatable world to entertain. Something else I tend to like about the Duplass projects is that they use relatable actors. By which, I mean, that they aren’t all fashion model beautiful. Their new project does just that. Makes the everyday world and everyday problems interesting. 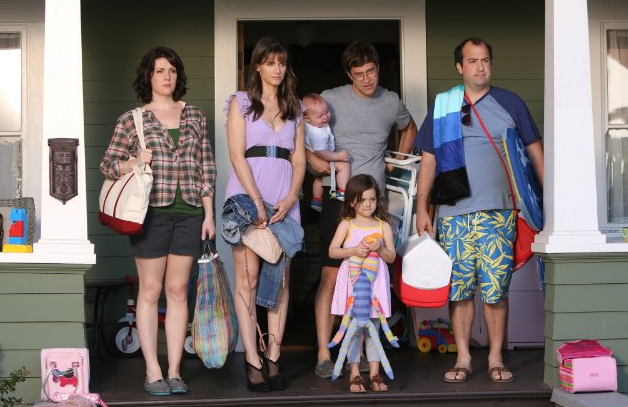 TOGETHERNESS is a comedy about a family that doesn’t necessarily have it all “together”. While dealing with the typical marital problems, the central couple has taken on a bit more stress than they can maybe handle with the wife’s sister unexpectedly moving in and the husband’s best friend doing the same. Add a baby and a small child to that equation and let the chaos ensue. This comedy, like other Duplass work, tends to emphasize the importance of the real world and real issues faced by people over the course of their lives. It focuses on the importance of knowing and understanding the self, while not being selfish. Most importantly, it tends to focus on the family (although that may not be strictly-blood related family) and the connections people make and how they’re maintained. The first episode of TOGETHERNESS holds promise without being too flashy. My suggestion, give the first episode a shot if you like the Duplass brothers or if you’re ready to see something real. I certainly am. Hello! So, before I get any deeper in this whole blog thing, I wanted to let you all know how I get my information on the people who are behind and in front of the camera for film and television projects. No, I am not fortunate enough to have a photographic memory and simply memorize all the credits and production details, instead I, like my film and television industry compatriots and fans alike, use IMDBPro. Now you may think, “oh, I’ve used that before, that’s no big deal.” And while most people have been on IMDB, which is a free internet database of released films and television shows and some films and television shows that are still in production, IMDBPro is a subscription service that has more in-depth details about productions. For example, you can see productions that are still “in development”, meaning they are not even being shot yet, but are still in the beginning stages. You can also see greater in depth details about production companies and projects that aren’t off the ground yet, or are very hush hush. IMDBPro is great because it has all of the information you could possibly get, without being on the project yourself. You can get a free 30 day trial of IMDBPro if you want to find out what all the hullabaloo is about yourself, but after there is a monthly fee. If you have any other questions, let me know!